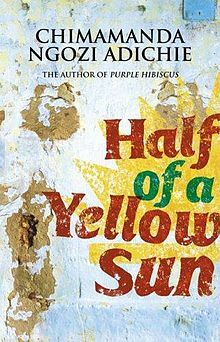 What a beautiful and heartbreaking, sweeping, great novel, told from a multiplicity of interwoven perspectives in the 1960s, during the brief, doomed life of the African state of Biafra. The only thing I knew about Biafra was Jello Biafra (front-man for awesome punk band The Dead Kennedys, once upon a time), so I enjoyed a nearly perfect process of suspense and discovery as I first got to know the characters and then began to suspect where their political situation was headed, and then understood what role they played as metaphors for their social class and their society. Chimamanada Ngozi Adichie is a beautiful writer, with the skill to describe and stay in the moment and let events tell her story. Her characters are romantic—Odenigbo the handsome African revolutionary, the elite Ozobia twins, daughters of a corrupt Nigerian businessman, the hapless Richard writing his expat novel—but in the best sense, as people who are fun to read about, who grasp our attention and mean something a little more than themselves. Funnily, I read a slam of Adichie in the Los Angeles Review of Books this month, by the writer Mukoma Wa Ngugi reviewing the collection Africa39, which criticized her characters for just this quality, saying that hers is “an aesthetic that is so concerned with not telling a single story of poor, fly-infested Africans, that it goes overboard into the academic halls of Princeton, of mansions, housemaids and casually worn and perhaps ill-gotten wealth.” Wa Ngugi says that this is an “African, middle-class aesthetic.” I suppose I can see that, but it seems caviling, given the scope and lusciousness of this grand Africa novel. Wa Ngugi also says that her “writing style does not allow her to enter into her character’s inner lives, nor does it allow her a grasp of their trauma.” He’s speaking of Americanah, which is up next for me, so I suppose I’ll see. I loved this book, and thought Adichie was a master of character, storytelling and theme. I feel like there is this “damned if you do, damned if you don’t” thing that happens when fiction is set in a country with people of color. I read books like this and can see all the places where some people will say the book went too far while others will say it didn’t go far enough. I’m not sure what do do or say about the situation, though. Someone smarter than me will have to fill you in. It’s the weight of being representational which is thrust upon people with inadequate representation. How can one writer represent her entire country? It’s impossible. On the other hand, his criticisms of her writing are valid. I’ve just read Americanah and it’s both a great book about race, and also a Upper Middle Class romance novel. I can totally see how an African intellectual would be annoyed. You should read that one, if you’re interested. I found it thought-provoking. Thanks for reading!